During a lifetime, the average person spends an average of 80,000 hours at work (this is assuming we all work only 40 hours per week for 40 years). In other words, work matters. Whether you’re a student, stay-at-home mom, or a corporate executive, everyone works because it is at the root of what it means to be human. From the very beginning, God commissioned work as a means to bring glory to Him, reflect His character, and enjoy Him. However, since the fall, our culture and hearts have distorted the true meaning of work: work becomes an idol or we become idle. Therefore, our understanding of daily work must be conformed to the the word of God. 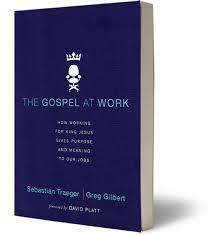 In The Gospel At Work, Traeger and Gilbert provide us with a robust understanding of work. Their main thesis? Work matters because you work for the king. Whether you love or hate your job, your work has value because it is the King who has assigned you to the task and it is He whom you serve. The authors constantly remind us how our work is not meaningless because of the restoring power of the gospel. The gospel transforms our hearts so that we can joyfully and excellently do our jobs in our service to the King. The book is structured around the two ways we can make work sinful: idolatry and idleness. The authors define work as idolatry by saying “our work become idols when we over identify with them.” Idleness is, therefore, defined by “underidentifying” with our work. We either worship and find our value in our jobs, or we undervalue our jobs and give little effort to our work. Both ways, render us useless to the King. We either worship and find our value in our jobs, or we undervalue our jobs and give little effort to our work. Both ways, render us useless to the King. The authors do a great job of providing us with a detailed description and prescription to both heart problems, all the while maintaining a clear and robust theology of work. More importantly, this book helps us see how the gospel empowers and sanctifies our daily work. It is a truly gospel-centered book. Praise be to God that Jesus took on the form of man, died for our sins, and rose again so that we, by the power of the cross through the Holy spirit, can be faithful in our service to the King.